There are moments in Kingdom Hearts 3D: Dream Drop Distance, when, caught up in a storm of hectic keyblade slashing and chromatic aerial theatrics, you might not notice the ticking timer on the bottom of your screen. Until it hits 0. Then, abruptly, as if the game has decided you were having too much fun, your protagonist will pass out. You'll have to switch to your other hero, who is on an entirely separate quest in an entirely separate area. If you switch back, you might find you've lost some progress. If you were fighting a boss, you'll have to start again from the beginning of the fight. You could lose 10 or 15 minutes of gameplay. It's a feature almost awful enough to ruin the rest of the game. Almost. But not quite. See, despite this infuriating Drop system, the latest Kingdom Hearts is a nice little package of bouncy combat and lighthearted adventuring, a game well-suited for Nintendo's 3DS. Dream Drop Distance is pleasant on the eyes and on the ears, and even at its most aggravating moments, it's always endearing. Like most Kingdom Hearts games, Dream Drop Distance stars series mainstays Sora and Riku. This time, Sora and Riku are each on their own adventures, destined again to be BFFs separated by forces outside of their control. Linking the two heroes is the aforementioned Drop timer, which may be the dumbest feature I've seen in a video game in quite a few years. There is nothing fun, strategic, challenging, rewarding, or acceptable about this exercise in futility. You can buy yourself extra time with an item, and you can quickly swap back and forth before a boss battle in order to reset one character's gauge and be sure you have enough time for the whole fight, but the whole mechanic is just tedious. And totally unnecessary. WHY: Because it might not be perfect, but the fighting sure is fun. What I played: Around 20 hours, finishing up most of the worlds. Tried to beat the game in time for release date, but spent way too much time dying to bosses. Zipping around like Superman on crack with a giant key. The infuriating Drop timer system. Dialogue like "The moment someone else looks at us, we begin to exist." So. Sora and Riku are learning how to graduate from Keyblade Apprentices to Keyblade Masters. To do so, they've got to pass a test called the Mark of Mastery. This involves traveling between Disney worlds and solving crises in each one. The usual. As each character, you'll have to go through seven main worlds. Some you've seen before, like Traverse Town and the giant whale Monstro. Others are new to the series, like the world of Disney's Three Musketeers and The Hunchback of Notre Dame's gypsy-stuffed take on Paris. Some of these worlds are not very fun, particularly the game's first two—based on The Hunchback of Notre Dame and Tron: Legacy—which are significantly less interesting and rewarding than any of the game's other settings. If you find yourself bored in La Cité des Cloches or the Grid, don't worry: It gets better. The writing, however, does not. Kingdom Hearts 3D: Dream Drop Distance's dialogue is as clunky as its title. Characters will say things like "Maybe we're walking the wrong path, but our hearts will lead us back to the truth!" and "Did your heart have the answer?" without the self-awareness to realize that most of what they're saying is pure gibberish. None of this is particularly unusual for a Kingdom Hearts game, of course, but that doesn't make it any less painful to sit through. Still, I couldn't help but be charmed by Donald Duck's Ke$ha squeaks and Goofy's Peyton Manning drawl, which is why I was disappointed to find that they're barely here. Instead your companions are all Pokémon called Dream Eaters that can be trained, leveled up, and even stroked or fed like old-school Tamagotchi. Square Enix wisely chose not to implement Dream Eater pooping. When judged by personality alone, these companions make awful replacements for Donald and Goofy. 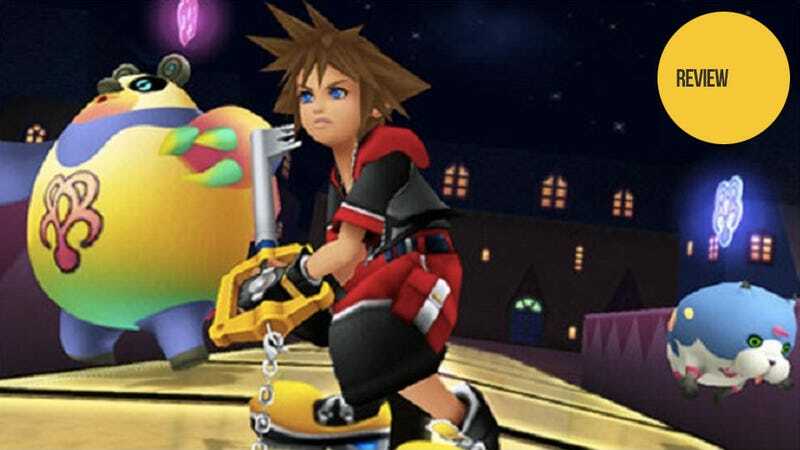 They're useful in combat, though; both Sora and Riku can link with their critter companions to abuse what is basically the Limit Break of Dream Drop Distance—a super-powered attack that, when used properly, can deal a ton of damage to everything around you. Not like you'll have a hard time dealing damage. You can load up your characters with powerful skills and spells. You can also bounce off the walls or jump into poles to activate a new mechanic called Flowmotion, which is sort of like going Super Saiyan, but less glowy. In Flowmotion, you can use short bursts of speed to dart around the world, vaulting up towers and building up momentum as you zigzag from structure to structure, leaping off walls to stay in the air. You can abuse these newfound powers to assassinate enemies and collect treasure chests in every corner of the map. Or you can just zip through the game, Superman-style, flying over obstacles and zooming above enemies. It might be the most satisfying combat system in any Kingdom Hearts game to date, although Dream Drop Distance still has some ridiculously challenging bosses. In the past two weeks, I have died roughly four thousand times to boss battles in this game. Occasionally, I would die not because I did something wrong, but because the camera couldn't keep up with my attacks. This was quite annoying, as you can probably imagine. During one boss battle I even had to deal with some nasty lag, the first I've seen on my 3DS to date. Still, even when boss fights almost drove me to throw my 3DS at the wall (which I guess would've given me an excuse to buy an XL), the challenge and even the camera issues made victory feel totally rewarding. And I didn't mind most of Dream Drop Distance's issues, not while I was zipping and dashing around Monstro's stomach or the Musketeers' cathedral. The act of flying around these worlds is pure joy. Although it's hard not to miss Donald and Goofy—or, for that matter, party members who can actually talk—it's easy to ignore the inevitably incomprehensible story (and even skip cut-scenes) in favor of whacking your way through lovely Disnified worlds. Dream Drop Distance isn't a great game. Nor would it earn a particularly high ranking on my list of "video games you must play in your lifetime" (which, of course, starts with Suikoden II). But it sure is fun.